Airline ticket taxes are deductible only if the ticket itself is. 1. Are Personal Liability Insurance Premiums Tax Deductible? The Internal Revenue Service allows taxpayers to deduct certain types of taxes from the federal taxes they pay. Airline passengers pay taxes on their tickets, but these taxes are not among the deductible taxes except in limited instances. When the price of airline tickets is deductible from your taxable income, you can also deduct the taxes on airline tickets. If you are self-employed and you buy a plane ticket for business travel, the entire cost of the ticket is a deductible business expense. Taking the deduction reduces your business's reported profit, which in turn reduces the amount of income you will report on your tax return. Report the cost of the ticket – including all taxes and fees – on Schedule C, Line 24a, "Travel" of your IRS Form 1040. Employees who travel as part of their jobs typically will have their travel costs paid by their employers. 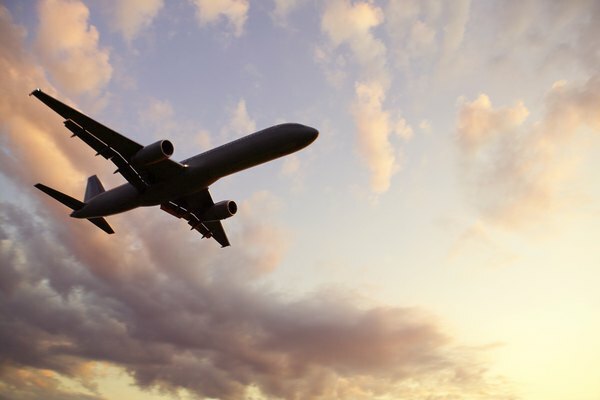 But if you paid for work-related air travel and did not get reimbursed, you may be eligible to deduct the ticket cost, including the taxes and fees on international flights or domestic ones, as an "unreimbursed employee expense." These types of deductions are generally only available through tax year 2017. To do so, you need to itemize your tax deductions using Schedule A. The ticket cost goes on Line 21. You must also fill out Form 2106, which details your travel expenses, and include it with your return. On Schedule A, unreimbursed job expenses get lumped in with several other miscellaneous deductions. The schedule instructs you to add all these deductions together, then subtract 2 percent of your federal adjusted gross income. The remainder is your allowable deduction. If you travel to search for a new job in your current occupation, you can treat the cost of the airline ticket, including the taxes, as an unreimbursed employee expense, using the same rules that apply to other unreimbursed employee travel. You can do so even if you don't actually find a job during the trip. If you have to move to take a new job, you may be able to deduct the full cost of plane tickets purchased for the move. In general, for moving expenses to be deductible, your new workplace has to be at least 50 miles farther from your former home than your previous workplace was, and you must move within a year of starting the new job. If you qualify, you can deduct the cost of airfare for moving you and your family from your old location to your new one. To claim the deduction, file Form 3903 along with your tax return. Airline ticket costs, including all taxes and fees, go on Line 2, and your total deductible moving expenses go on Line 26 of Form 1040. Job-search travel is not deductible if you are looking for a job for the first time, if you are looking for a job in a different occupation or if you had been out of work for a substantial period of time before you took the job-hunting trip. The IRS does not specifically define "substantial," which means that claims are evaluated on a case-by-case basis. Pre-move house-hunting trips are also not deductible as moving expenses. Also, keep in mind that you can only claim miscellaneous itemized deductions, including job search costs, unreimbursed employee expenses and moving expenses if you itemize your deductions. The business travel tax deduction is essentially the same for self-employed people in 2018 as in previous years. The type of miscellaneous itemized deductions that includes employee travel and other expenses, however, is not available under the new tax laws going into effect for tax year 2018. If your employer does pay for you to travel for business purposes, that payment is still not taxable as income. The standard deduction is increasing to $12,000 for single people, $18,000 for heads of households and $24,000 for married couples filing jointly, which may mean that some people with unreimbursed travel expenses would no longer have found it worthwhile to itemize their deductions in any event. Under the tax law for 2017 and earlier years, you can deduct miscellaneous items including employee travel that exceed 2 percent of your adjusted gross income. You must itemize your deductions, and in some cases you may save more by simply taking the standard deduction, which for 2017 is $6,350 for single people, $12,700 for married couples filing jointly and $9,350 for heads of households. What Reimbursements Enter Tax Returns?